Welcome back to part 3 of my series on improving your lead guitar phrasing. In parts 1 and 2 we explored what guitar phrasing is and why it is important for you to develop on your path to fully expressing yourself on the instrument. We last looked at the famous “Panama” solo by Eddie Van Halen as a prime example of all the great guitar phrasing concepts we’ve been discussing. Now it’s time to stop talking and start working with some real musical examples. In this 3rd article we are going to focus on legato phrasing. Before getting to the examples I want to be clear about exactly what legato means to us in the context of lead guitar phrasing. Legato means: “In a smooth, flowing manner, without breaks between notes.” As a rock guitar soloist utilizing hammer-ons, pull-offs, and sometimes tapping while picking very few notes usually creates this smooth legato sound. So, in essence, what we are talking about here is phrasing our solos and improvisations with mainly hammer-ons and pull-offs and picking as little as is necessary. Legato phrasing sounds very different from staccato phrasing that has a sharper attack and usually involves picking the majority of notes. Neither technique is necessarily better than the other; they are simply different. Think of legato, and all techniques, as tools to explore and use in your own unique way. As mentioned in previous articles, self-expression is really the goal of developing your guitar phrasing skills. I think that you’ll find that the legato technique can be very expressive. So, let’s explore a few specific ways you can apply legato sounds to various scales, modes, and arpeggios. We’ll start with our old friend the minor pentatonic scale. This example uses the A minor pentatonic at the 5th fret. This type of phrase is fairly common and can be played very fast and fluid. It’s well worth your while to work on legato sequences like this through all 5 pentatonic patterns. Experiment with picking as little as possible. 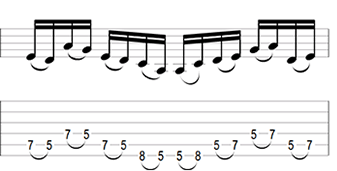 Bars 1-3: The solo starts out with a bang with a fast sextuplet phrase combining tapping and fret hand hammer-ons and pull-offs. For that exotic sound I’m using the E Phrygian Dominant scale. As always practice slowly and work up to speed at your own pace. Be sure to mute the open strings to keep this phrase clean sounding. Bars 4-5: After the tapping phrase the fret hand shifts immediately up the neck to play the fast descending legato phrase before finally landing on the E note on the 3rd string with lots of vibrato! Notice the tension that builds at the start of the solo and the resolution that occurs at the end of this phrase. Tension and release is a big key to making your solos sound interesting. I’m only picking when changing strings. Sometimes when I play this live I actually don’t pick anything and let the fret hand do all the work. Bars 6-10: Notice the slithery legato guitar phrasing in bars 6 and 7. These are simple to play but require the proper accents to make the notes pop out a bit more. In bar 8 I use ascending trills that lead to a descending E major arpeggio in bar 9. Again, take note of how tension and release is used here. Finally in bar 10 I keep the legato sound going with slides, hammer-ons and pull-offs, and a tapped harmonic to cap things off. To hear audio examples of many of the phrases in this article as well as learning much more about what you can do with legato phrasing check out my downloadable 'Killer Rock Lead Guitar Legato Guitar Phrasing Course" now. Learn how to play lead guitar for rock and metal with an online electric guitar tutor.